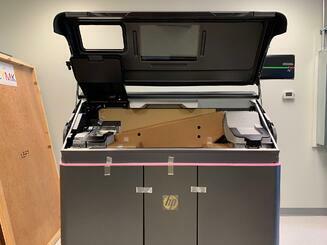 A 3D printer that is actually built with 3D printed parts from an HP Jet Fusion! Located in TECTERRA’s head office, the Geospace provides geomatics test and development equipment that is available for use by Canadian companies engaged in development of emerging technologies. In addition to a comprehensive inventory of equipment, the Geospace offers rapid prototyping services with the Fortus 400MC FDM 3D Printer and – as of today - the first-in-Canada HP Jet Fusion 580 3D Printer. The 580 offers 10x faster printing times than comparable plastic fused deposition modeling (FDM), stereolithography (SLA), and material jetting solutions while also eliminating the z-axis weakness that is prevalent among these models. The printer can also produce brilliant, full-color functional parts while maintaining optimal mechanical properties. The full range of vibrant colours are expected in the ne xt firmware update in a few months. With the ability to produce engineering-grade thermoplastic parts, these machines are designed for projects that require larger individual parts, or heavier production demands. In addition, the printer has the capacity to achieve fine detail and high dimensional accuracy for small features. In addition to rapid prototyping services, the TECTERRA Geospace Lab hosts numerous training courses covering a variety of topics, including rapid prototyping best practices and fundamentals. Two Geospace Lunch & Learn training sessions will be planned for April - sign up below to receive updates and event information.